You can see much more data in the full list. Who are the top 1,000 eBay sellers? These are the sellers who have gained the most feedback in the last 12 months. Feedback volume is a useful approximation of the number of units sold, but is not directly linked to sales revenue. The top three sellers on the list are now the same for three years running – musicmagpie, worldofbooks08 and medimops. The whole top ten shows little movement, with only two sellers entering since last year: discover-books of the US have climbed from #78 to #9, and ppretail from the UK are up from #16 to #10. Below, I’ve drawn some insights from the data. I’d love to hear your own observations in the comments at the end. 36% of the top 1,000 eBay sellers are serious cross-border traders – they are based in one country, and make most of their sales to another country. After years of steady growth, from 31% in 2014, 35% in 2015, 38% in 2016 and 39% last year, we have finally seen a fall in cross-border trade among the top 1,000 this year. Of the 362 international eBay traders, 87% are based in China or Hong Kong – 316 sellers in total. This is an increase in percentage terms from last year, when 85% of cross-border sellers were based in China or Hong Kong. But it’s a decrease of 7% in absolute terms, from 330 sellers last year. Which countries do Chinese businesses sell to? This year, there has been a decrease of 6% in the number of businesses on the list selling from China to the US and Canada. But the number of Chinese businesses selling to the EU (including the UK) and Australia is almost flat, decreasing slightly from 164 to 160 of the top 1,000 sellers. In summary, almost one third of the top 1,000 eBay sellers are Chinese traders selling to the US, Europe and Australia. International sellers from other parts of the world fell by 21% from 58 to 46 sellers. Australia has been a big success story for eBay, and has also attracted a large number of Chinese sellers. Amazon started selling in Australia at the end of 2017, and looks likely to massively disrupt the ecommerce industry there. Cross-border trade is not completely dominated by China. But Belgian philatelist, and list stalwart matthijs_philatelie at #40, is now the only cross-border seller in the top 100 from outside China. Last year the top 100 also featured internationally-focused sellers from Europe xa-electronics and vidaxl_de, and bitb99 from Singapore. Of course, these are not the only international sellers, just those who primarily sell outside their home country. Huge numbers of eBay sellers trade across borders, but most still make the majority of their sales in their home country. Which countries have the most top eBay sellers? These are the countries with the most sellers in the top 1,000. Looking at the country standings overall, China has actually lost the 10 sellers it gained last year, while the UK has gained 32, the US has gained 7 and Germany has lost 13. At this rate the UK could actually leapfrog China to take the top position in little over a year. Last year the UK lost 18 sellers in the top 1,000. Could we now be seeing the effect of the UK economy getting used to the idea of Brexit? 1 – Sellers without an indicator were not in the 2017 list. Hover over the indicator to see the 2017 position. 2 – Total feedback received. This is shown instead of the better known Feedback Score, which can be an inaccurate indicator of sales volume. 3 – Positive feedback received in the last 12 months. This differs from eBay’s own feedback percentage calculation which excludes repeat feedback from the same member for purchases within the same calendar week. 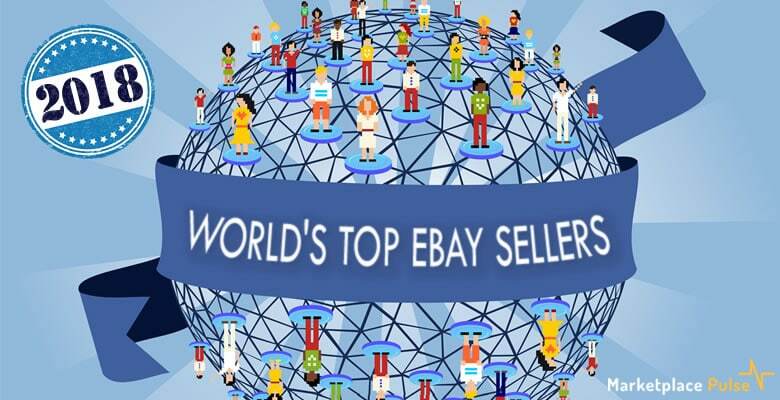 This is the fifth annual edition of The World’s Top eBay Sellers. The raw data was provided by ecommerce intelligence firm Marketplace Pulse in September 2018, with further research on cross-border selling undertaken by Web Retailer. In previous years, the data was all sourced by Web Retailer directly. The list is ordered by positive feedback in the last twelve months. Feedback is an indicator of sales volume, but not revenue. Not all buyers leave feedback, so the number of units sold will be higher than the volume of feedback received. Reports from Tamebay and EcommerceBytes suggest the typical proportion of buyers leaving feedback is between 40% and 70%, with a bias towards the lower percentage. If you have any questions just let us know in the comments below! You didn’t say but I assume this list was by revenue. One thing that I noticed is that there is a lot of media sellers in this list: books, video games, music, and DVDs. One wonders how sustainable this business is or whether they are just serving as liquidators for other companies. I see you make note of sellers having a premium store outside of their home country. I have never considered this myself. What advantage would it be? I sell in UK, OZ, and other english speaking countries by just extending my listings. Hi Jack, actually the list is by feedback in the last six months – so an approximation of sales volume rather than revenue. I’ll see if I can make that clearer. It would be interesting to dig further into the business models in use. I was a little surprised by the variety, and yes media does figure prominently. Maybe it’s an indication of the low margins in media, and therefore the need for very high volumes? I don’t think there’s a benefit of using a non-home eBay site to make your store premium/featured (it will appear in that country’s premium stores directory, but I doubt that has much value). I’m using it to indicate that a seller is almost entirely focused on selling to a country other than their own, if that makes sense. 2nd on the list estocks AKA MusicMagpie. For media you would definitely need volume. I was grocery shopping at my local wal-mart today and was amazed at the amount of media product in bins at insanely low prices. Perhaps I am just ahead of the curve but I haven’t paid for real media (non-downloadable) in a couple of years so selling it seems a bit dated. Wonder what the ASP is for these sellers and what return rate or non payment rate might be for them. Non payment rate and return rate is significant in many categories and may not be taken into account in this if its mostly feedback related. Anchor shops are included, do you mean as a separate list? Andy yes as a separate list as that would help us lesser mortals to gauge whether or not anchor shops are worth the extra bucks, since we signed up for an anchor shop we haven’t noticed any increase of sales and considering we have gone from 1000 items to nearly 2500 listings now. I made my decision for an Anchor shop (yes, I got one) because I evaluated the number of free listings versus what i would pay for listing fees. My total fees are much less. This is in the US, your mileage may vary elsewhere. Easy enough to do the math based on your local marketplace’s rule. Hi Andy, thanks for your list. Do you know why most of the chinese cross boarder seller have no more active listings?? Hi @Worner, I’m not sure what you mean. I’ve just clicked the links for all the Chinese sellers down to #70 and they all have active listings. Am I missing something? Hi Andy, interesting post! I was just wondering, what do you mean by they are based in ine country but “have a featured store” (or anchor) in another? Do you mean their store comes up on the list for featured stores in that other country, eg in the US for a seller based in china, say? Thanks Julia! Yes, that’s exactly it. They have upgraded their store to premium/featured/anchor using the eBay site in another country. I didn’t find any stores that were on the featured list on more than one eBay site, by the way, so I think that’s probably not possible to do. In most cases they will be shipping direct from overseas, yes. They could choose to hold stock locally to their buyers, but most will ship direct. I was amazed to find such a comprehensive list, but I was totally stoked to find us on this list. I’m so proud of our team for making this achievement in under 16 months and I must give a big thankyou to you Andy for giving us a benchmark to work towards. Hi there, I noticed your comment and I’m writing a paper on what makes a sensational ebay seller – would you please be able to give me some hints and tips on why and how you have become so successful? I’m based in Australia, so, would really appreciate your feedback. thanks Jules. Whys Babz Media not included? I’ll look into that, thanks for flagging it up! It did cross my mind too Andy, I’d be interested to know why it was missed. For me, its always the one that springs to mind for the bigger eBay sellers. It looks like eBay’s featured stores directory is a little erratic, I’m looking into getting the list updated for babz and any others missed. The list has been updated now, with babz on top and a few other additions. Hi Chris, the list is ranked by positive feedback in the last six months. Your eBay account discofashion had 2,698 positive feedback in the last six months, but number 1,000 on the list dynamicsounds00 had over 23,000 (at the time of the research, it’s now higher). Of course this has nothing to do with sales volume. How about you gather for us a list of top sellers by sales volumes? Do you mean sales revenue? I think feedback actually correlates well with sales volume (number of units sold). I don’t have a data source for revenue, but you could use Terapeak to research specific sellers. Hi Andy, I was looking at the Google drive document you shared at the end of the article. You have a column that shows “Store Size.” What exactly does that number represent? Hi Samantha, actually I intended to remove that column and have done so now! It’s the number of “matching items” shown in eBay’s Premium Stores directory. The number is really unreliable – a store with 6 “matching items” in the stores directory could have 440 or 784 (or any other number!) results when you go to their store. Maybe there is some logic to it, but I haven’t been able to figure it out. Hi Richard, yes potentially! You can get in touch using the “Contact” link in the footer. Awesome collection of data Andy, my store just missed the list (19,500 in the past 6 months). Although revenue is a hard metric to gather data on, I think you would find it to be all over the board with with some correlation to category. For example a seller that specializes in cell phone cases maybe have an average purchase price of $5.00 while an auto parts seller like myself has an average purchase price of around $55.00. even if that store is processing 2 or 3 more transactions than I am, my GSV is many times greater. We would all apprecieate it if eBay would pubically share this data, not a chance that will happen tho…. eaither way, thanks for putting this together. Thinking aloud here… with an average sale price per category and % of sales which get feedback I could actually estimate GSV for these sellers. It’s not something I will attempt any time soon though! I think that would get you closer but with some outliers in the data. For example: a seller that sells iphones vs. one that sells iphone accessories. Same top level category with much different average sale price. Pulling terapeak data on every seller would really be the best way estimate this variable using a sample size of a 30 day window or something to find an average store transaction price. The question then boils down to… who is more of a top eBay seller? The store that sells 100 cars a month or 10,000 sets of brake pads? Hi Andy, I am umo88 on eBay and I believe I should be on this list. In 2014 we will do 50,000, $25 transactions for about 1.25 million in business. Check us out we have an amazing model. If you are interested in a unique model we are it! I must agree with Scott, I am an electronic component re-seller and buy just about all of my items from umo88 and I do believe most electronic component re-sellers are right in there with me. You are by far the #1 electronic component seller on eBay with the best prices by far! Hey Scott, Hope you are doing great! I see that you are talking about a business model here. I find it interesting. I have been trying to get my company to the next level and I will like to talk to big sellers. I would like to do some investment in software. My listing, inventory and shipping teams is giving me a lot of overhead. However trying to find the right tools to adapt myself to the new incoming challenges. Thank you in advance! Hi Andy, thanks for the post. Do you have any material that would help me start selling on Amazon as a self fulfill merchant? I’ve tried Ebay using DSD only to have my account permanently shut down by Ebay. Sorry to be so late to the comment party. Is there a way you can program a script to generate this on demand? Thanks again, this list is great. Hi Dan, and congratulations on being #390! Yes I’ll probably update it around at the same time next year, and include a column for movement/new entries. It’s not a straightforward job extracting the data and it takes a long time to run, so there are no plans to provide a script. Hi Thomas, that seller has 1,786 positive feedback in the last 6 months. Number 1,000 on the list dynamicsounds00 has over 23,000 (at the time of the research, it’s now higher). I assumed you scraped the website rather than utilised the EBay API to produce the list? I am just curious about how you rank top eBay sellers, based on transactions, feedbacks, or money amount. Due to Universal Postal Union’s regulation, Chinese sellers were given a lot of advantages due to a much low shipping cost, especially for low weight items. Also, China is a world factory. But most of Chinese sellers sell light weight items or cheap items($0.01+free shipping). If your ranking is based on the number of transactions or positive feedbacks, they will surely be listed on the top. Also , a lot of US based eBay sellers have warehouses in China, therefore they are not exclusively US sellers. Hi Ankit, thanks for the comment. This list is about a year old, we’ll update it sometime soon and you can see if you show up then. Awesome list, have you ever thought to break it down to the same countries that Amazon is at, just like your Amazon list? Hi Geraldo, thank you. Yes that will be done when the list is updated. This is awesome! How did you compile this list? Did you hire people to manually enter all the data? Is there a tool where I can submit a query for ebay sellers and it will come back with a list? Thanks! Hi Bob, and thank you! We are planning an update within a few weeks. There isn’t any tool for querying eBay sellers as far as I know. Hi: Just came across this & find it very interesting & informative. I did a really quick run through & what jumped out at me is that there are only 42+/- out of 1000 with 100% feedback, a LOT between 99-99.9% with many just barely over 99%, and tons between 98-99%, quite a few just barely over 98%. An awful lot of us small sellers maintain our 100% positive feedbacks because we are so customer service oriented. The big guys must value quantity over quality in a lot of cases. I am looking forward to the next version. Could this be announced in the monthly newsletter? Thank you Nancy. That’s an interesting analysis. Perhaps the big sellers lack the personal touch to push their feedback score higher. And while a 100% score is something to be proud of, I don’t think it makes a big difference either to buyers or eBay’s algorithms. So the big sellers probably don’t think it’s worth the extra effort. We’re working on updating the list now and it will be announced in a couple of weeks. Hi Andy, is there going to be a new Australian Sellers release this year? Hi Keisha, yes we’ll update all the lists this year including Australia. Thanks for bringing this list together, Andy. Love looking at the geographic segmentations and categories of top sellers. Great stuff! Great info. Thanks for sharing. Is it still possible to view the date via shared google drive? Hi Klam, glad you like it. We’re not planning to share on Google Docs this time but if you drop me a line and let me know what you plan to do with it we’ll see what we can do. Hi Andy, thanks for sharing! May i know the ebay ID for malaysia seller? This ought also to be listed or ? Yes, it does appear they should be listed as they had 67,023 feedback in the last 6 months. If they haven’t changed their user ID, then there was probably a bug of some sort meaning they weren’t listed in the eBay seller directory at the time of the research. We were delighted to be on the top 1000 list last year – but seem to have missed it this year? Could you let us know where we came please? Can you advise how outdoors camping, hiking and backpacking equipment performs on ebay. Very accurate and amazing report. I have seen few familiar sellers that I used to browse on ebay and I would agree upon seeing them on that spot, especially on jewelry category. Keep it up Andy! Great Stats! Some of the largest sellers on the list are using StoreFeeder to automate a lot of their manual tasks – without automation of stock control, order processing and channel management sellers are usually restricted by the age old enemy – time. Great to see our customers doing so well! Absolutely love these. Awesome work. These are what led me to find webretailer in the first place, and while I now know there’s a ton of other great content, I always look forward to these! I would suggest using terapeak to peg each sellers asp over the last 90 days and then multiply by feedback x 2 to estimate total GSV. There is a massive difference between a company who sells iPhone cases with an asp of 5 bucks and a auto parts seller with an asp of 100 bucks as different sellers will vary wildly and the industry uses GMV as the standard size benchmark. Right now you are basically saying that a dollar store is larger than a car dealership simply because they have more transactions. Just an idea to take the data another step. 1) As you have recognized, feedback has fallen to now what looks like about 40 to 50% of actual sales. A lot of people also dont like leaving negative feedback, when it should be, again this screws up the numbers because they dont even leave a neutral or positive. The old cliche thrives still, “customers rarely complain…….they just never come back”. It leaves a door opened that marketing and sales strategists should be trying to work out how they turn these type of customers into their most important – i.e honest, constructive feedback that can be priceless, if fixed. 2) This overall feedback includes all positive feedback? As a seller and Buyer? If thats the case, which I believe it is, then how can it be an indicator even towards sales volume when buying, positive feedback by the seller ( that is the seller makes a purchase and receives positive feedback) is counted towards a “sales volume” indicator??? Yes absolutely feedback is only an indicator. However, I don’t think the proportion of buyers that leave feedback is a problem for this ranking. It is still an “indicator” (i.e. correlated to sales volume) whatever the percentage who leave feedback. On your second point, yes it will include feedback received as a buyer. But, and this is a huge “but”, even the lowest-ranked seller (at #1000 in the main list) received 44,000 feedback in the last 12 months. We are taking about substantial businesses here, not hobbyists. I expect the vast majority of sellers at this scale will not be doing any buying at all with the same account. To make any kind of impression in their feedback score through buying would take a big effort anyway, and would simply not be worth doing. Appreciate your reply and agree with what you say to a degree. It was I guess a comment I needed to make in relation to reading some other comments in relation to the reports themselves yet the true reflection and how feedback is gained by a buyer I dont think is spelled out correctly. All that put aside, the figures Im looking at are of great concern in relation to the % of customer actually giving feedback. Especially, in my opinion, this is one of the greatest attributes to an eBay store. Im seeing it heading south to about 38.5%. Would be interested to know your thoughts and have there been any reports or studies done on the reasons (or human nature and/or generational change) for this figure to be so low as I recall 5 years ago was more like 70% (off the top of my head). Hi Glenn, I think it’s due to eBay’s change away from a buying and selling community to a more transactional site. In a marketplace with a strong community spirit, feedback is a normal way to maintain and build the community links. In a marketplace which is more about making purchases from profit-driven companies, there’s not much motivation to leave feedback. It takes time and there’s no real benefit. I’m surprised the percentage is still as high as it is, to be honest. When are you bringing out the 2017 top lists for around the world. I want to see if I have improved from last year. We’ve started the process now and aiming for later this month. Interesting to see how much ebay has changed. the antiques market for much of it is slowly tanking. not that long ago antqiues would’ve been a top selling category but today it has been greatly overshadowed by new(er) consumer goods and will only continue to evaporate from the online landscape. Fantastic list. Where can I get the latest list from? Also is it possible to potentially get a dedicated research for eBay and Amazon? Great information Andy. Easy to see why China has the top slot on numbers of sellers when they have a low cost shipping option in China Express. The minimum shipping cost a US seller can have through eBay is $2.61, which is more than the cost of the item and shipping that many of the Chinese sellers are listing. Yes I agree. The “agreement” that the USPS and China have put together for super low shipping rates have penalized American sellers. As an eBay seller for the past 20 years, I have noticed that Chinese products are flooding the market and taking advantage of these low rates that Americans cannot get from our own USPS. Unbelievable! President Trump – are you listening? They were updated in September so the next update will be in mid-2018. My company not make part of the top 1000 but I know i’m near that . Is it possible to see the top 2000 or something ? You are at #1193 overall, so not far outside the top 1000! Thank you so much Andy !!! I want to find the name and e-mail address for the top eBay sellers in Hong Kong since I have a lot of things I want to sell and I need someone to do it for me. Just wondering how you sourced these users and when/if you’ll be updating the list again. Can you give us a list of the top Ebay sellers who have been banned from doing business with Ebay? Hi Andy – I have just skimmed through your post, and its pretty cool. lots of info. I wanted to ask an ebay question. I started to list items on ebay 4-1/2 months ago. I’m doing pretty well, but I wanted to ask – how important is feedback ? I’ve been listing mostly items from Aliexpress on ebay, and have had a bit of a problem with feedback, because it takes ~ 60 days to get delivery from China to almost anywhere. So, for the most part, I’ve been ignoring it, because I can’t tell when an item has been delivered. My ebay sales have slowed to a trickle within the past two weeks. Is this related to my feedback issue, or is it something else ? Feedback is extremely important on eBay. To ignore your feedback is to ignore your business… who wants to wait 60 days for delivery?